Post: Gaurav Akrani. Date: 1/27/2015. No Comments. Label: Human Relations. Let's discuss above guidelines to build relationships that are effective. The first most important step to initiate building effective human relations starts with you. Your decision to adapt and change on your behalf in a sincere manner is the most crucial one. If you are good and welcoming to others, they are likely to be kind to you too. In you are arrogant and rude, there is no doubt people will either avoid or confront you. 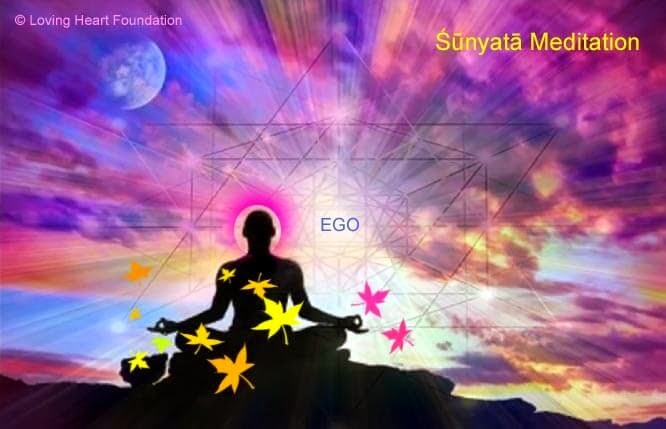 Conquer ego with meditation and be polite, humble, respectful and friendly. Image credits © Loving Heart Foundation. I feel the world, the way I sense it. I knew I lost cause; I failed my soul. Watch following video explaining the power of meditation. Video credits © Quang Cong. Any individual who thinks of the best outcome of almost anything and believes only good will happen in the end is an optimistic person. Such a person always emphasizes on keeping a positive attitude towards life and believes hope exists no matter how bad a situation gets. 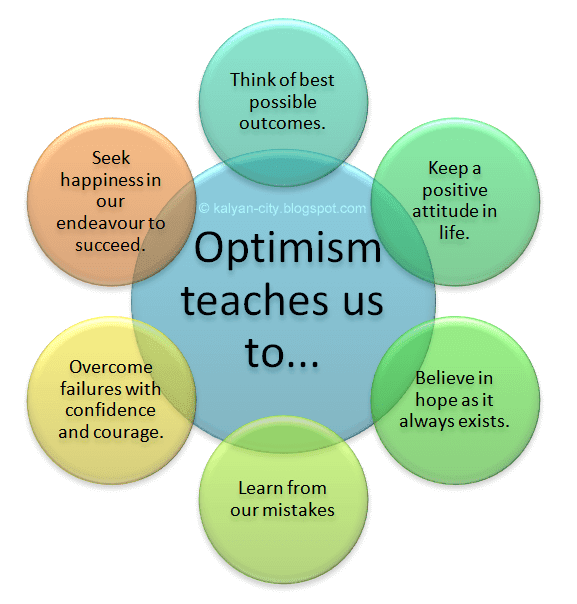 Optimism teaches us to overcome failures with confidence without losing our hope and enthusiasm. It helps us to forget bad memories of the past, learn from our mistakes and seek happiness in our endeavor to succeed. In contrast, pessimism holds us behind by entangling us in deep negative thoughts and unwanted worries. It stops us from learning, acting and prevent us from making a bold attempt. It hinders our progress and well-being. Hence, it is better to change our pessimistic attitude to a hopeful one. I cuddle hope in my unimaginable fears. There, I will smile in lighting-thunder. 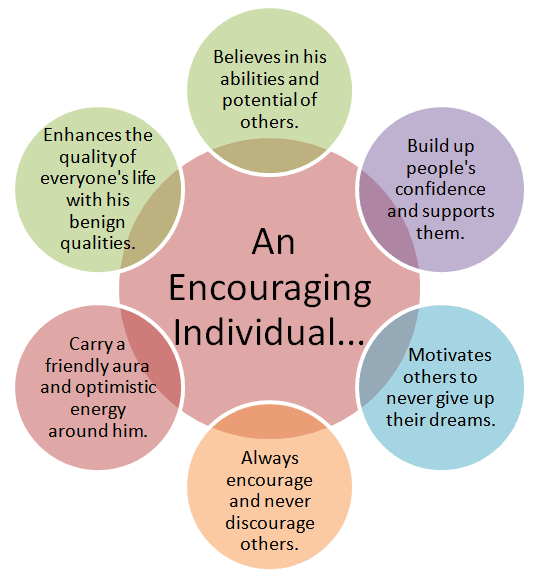 An encouraging individual not only believes in his abilities, but also in the potential of others. He always tries to build up people's confidence and willingly support them in their attempts to succeed. He guides and develops them to strengthen internally. He motivates them never to give up the beautiful dream; each of them is chasing. Try to be such a person. Most people at some point in their lives wish they had a buddy, who would have encouraged them in one way or another. If life gives you an opportunity, don't miss executing your benign role to be an encouraging close friend in someone's life. Hence, always encourage people in their healthy activities and avoid discouraging them if you believe they are on the right track. She raised me up charging every cell. She mesmerized my soul with an immortal tie. A complainer is a person who often gives excuses and expresses his strong resentment against others. He believes his life has become a mess because of others' actions, planning, decisions, and involvement. 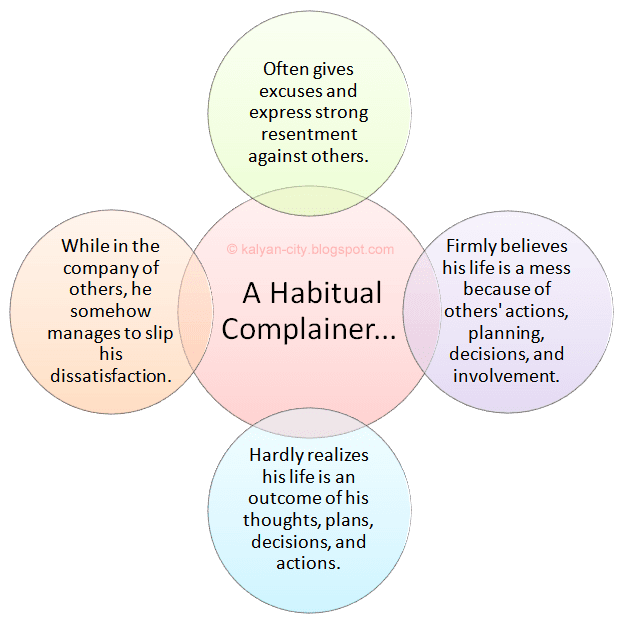 A complainer hardly realizes his life is an outcome of his thoughts, plans, decisions, and actions. Whenever he is in a company of someone, he somehow manages to slip his dissatisfaction. Nobody likes to accompany or associate with a person who is a habitual complainer. Discontent is a powerful negative emotion that has enough strength to disrupt the normal and calm mental state of a content person. Smart people understand this and, for this reason, only respond to genuine complaints. They also know how to identify and avoid a routine complainer from others. So next time when you are complaining, please take care. I'm sick of this world; I clinch. I'm waiting for a verdict by a jury. Criticism involves reviewing, examining or judging something (or someone) to find out its right or bad characteristics (or qualities). However, this is often practiced, or more used to express negativity. When people criticize someone, we are inclined to believe they are surely not talking well about that person. It is quite easy to say inferior about someone, but very difficult to handle someone talking bad to us. It is not quite surprising to lose our temper when we accidentally encounter someone is talking-low about us behind our backs. If we dislike something like this happening to us, then why let others go through the same mental agony. Why should we lose our empathy? So it's better we stop criticizing each other and start focusing on our lives. We must not forget that every human is special individual and not a perfect being. We all have some more or fewer pros and cons. As the journey of life progress; we must keep improving our personalities by adding more humane qualities and giving away vices. A gradual improvement is what we all can expect from each other. Gossiping is a deliberate act of conversing, notably about someone's personal life or private affairs. It is often done unnecessarily to sensationalize a petty issue, especially of an intimate nature to undermine one's social status and reputation. It spreads rumors and can eventually lead to embarrassment (shame), loss of confidence, seclusion, and depression for the sufferer (victim). Those involved in gossiping don't realize that their words can nearly destroy or kill someone. Imagine what will happen to you if everyone starts ridiculing you daily. If this didn't stop, a point would come when you can't handle this mockery anymore and break. If you don't like this happening to you, then you must also not let others go through this. For this reason, this harmful act must be avoided at all cost. If you truly like someone, it means you are sincerely interested in that person. It is this real interest that makes us act, and we automatically start paying more attention to others. It helps us to communicate someone, “I like you. I'm interested in you. I admire you.” People often respond positively to such a kind of communication when it comes to friendship, marriage, profession and business. Why won't they? It's our default human nature. We are all wired to desire and seek, attention, love, appreciation and respect. Next time you meet someone, greet that beautiful individual with courtesy, animation and enthusiasm. Use a tone of voice that radiates your sweet, welcoming and pleasing true-self. Attend and help them to the very best you can and be ready to witness the magical response you'll get. It will indeed work like a charm. People who face many difficulties and repetitive failures in their lives are usually those who are simply not interested in others around them. Don't be such a person. Show pure, authentic or sincere interest in best people you admire if you want to make good friends, increase your contacts, grow your business, boost your chances of opportunities and be successful in your life. Smile is a beautiful human expression in which eyes appear bigger and brighter, flexible lips slowly curve upwards almost symmetrically and start radiating inner bliss, approval, pleasure and happiness on the onlooker. Imagine a cute baby smiling. Now, how you feel? I'm sure it touched your soul and made you happy. 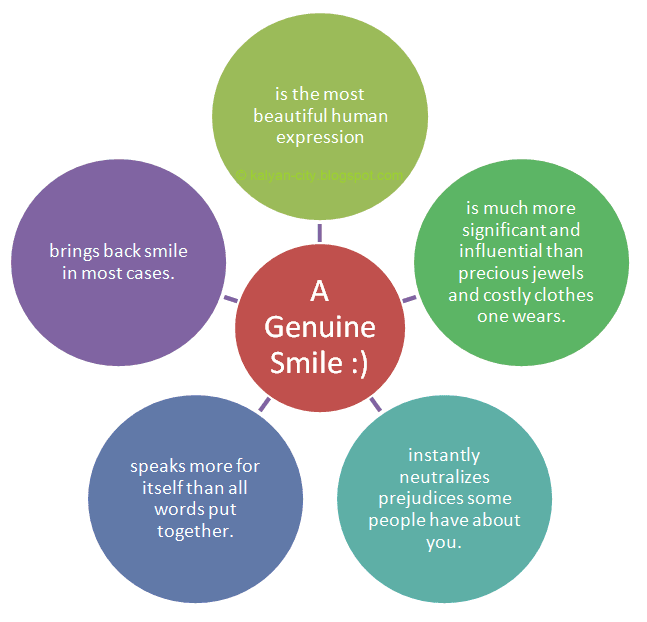 Whenever you want to make a good first impression on others, say in a business meeting or social gathering then never forget to wear a genuine smile on your face. One must not forget that smile is more significant and influential than precious jewels and costly clothes one wears. Some people may have prejudices about you with them, but once you greet them with a welcoming smile it instantly neutralizes all their preconceived notions. They soon realize how wrong they were about you. They create a positive image about you in their minds. Isn't that great? Carry out a social experiment of greeting people you meet daily. Greet a doorman, cashier, receptionist, bus conductor, a cab driver, so on. Note their responses, I guarantee, at most times they will smile back at you. It's that easy; happiness only reflects ample joy. Individuals who often wear a captivating smile are better at communicating, coordinating, selling, managing, teaching and raising happier children. They carry an auspicious aura around them. Watch streaming video on the power of smiling to improve human relations. Do not try cheating others with an insincere grin (broad smile that seems unsymmetrical and fake). Humans have a subtle inbuilt mechanism to identify real emotions. For this reason, develop a good sense of humor that is amusing and fun, but neither insulting nor hurting two others. Remember! Don't overdo it, neither fake it nor avoid it. Keep it all natural, well-balanced and synchronized with your real inner feelings. It will surely reward you with pure bliss and wonderful feelings. So smile and make others smile too. Individual's name is very dear and close to him. It is the sweetest and most significant sound in his life. It carries his identity that sets him apart from others. It is the sole thing he owns and keeps to himself and doesn't easily share with others. One's dignity and honors are attached to name. Smart, alert parents, take good care while naming their infant and try hard to find unique, meaningful, cheerful and easy to pronounce words. No wonder, most people are extremely proud of their names. For this reason, we must respect people's names by remembering, pronouncing and spelling them correctly. Most successful individuals are good at remembering complete names of people they often interact along with memorizing basic details about their personal likes and dislikes, important dates, family, professional, business and social life. Sometimes names can be difficult to remember, pronounce and spell. Very few individuals take extra efforts to master such names; they avoid using nicknames and quickly succeed in surprising their fellow men by calling them by their true loving names. Even school going kids love, appreciate and become more attentive if their teachers avoid using roll numbers and call them instead by their first name. 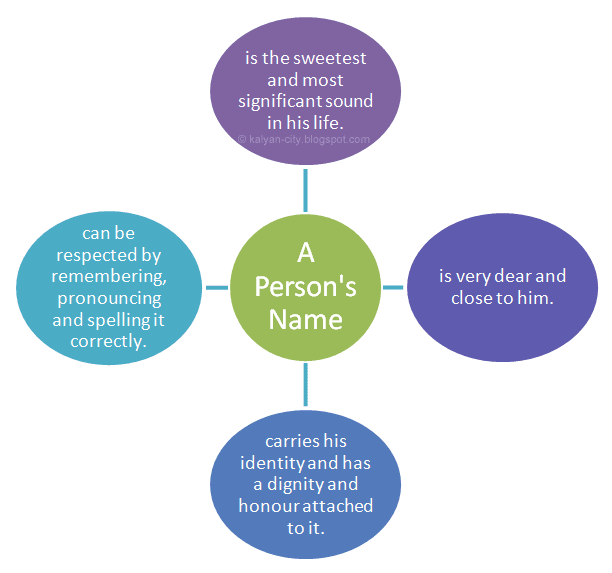 People get a feeling of importance if their names are remembered and properly pronounced by others. If you are still not convinced, see those millionaires who are ready to donate vast amounts of money to give their names to a college building, library or a nearby hospital. They give enormous donations to fulfill their desire that people should remember their names forever. Mughal emperor Shah Jahan constructed Taj Mahal in memory of his beloved wife, Mumtaz Mahal. Today when we say 'Taj Mahal,' we recall his wife's name. He truly succeeded in making her name immortal. However, there is an exception to this in the context of some cultures where greeting elders, women and influential people by their first name is considered offensive, disrespectful and insulting. So care must be taken to acquaint yourself with the local etiquette when you are interacting with people raised in a different cultural setting. Though very rare, there are also few people who don't like to be called by their real names. Maybe there is something about, they don't like their names. If you happen to meet such a person, talk to him and ask by which name you should call him. Once you know that, remember it and only stick with that name. Listening is a psychological or mental act. It keeps oneself alert (attentive) enough to decipher (convert or decode) sound of the words entering into the ear canals and later sensed on the eardrums into a meaningful understanding. Hearing, is a physiological (bodily) act that happens subconsciously without any active alertness or focused attention. Obeying means either to comply with some established rules⁄laws or to submit oneself to the authority of someone. So remember, whenever you're listening to someone, you are trying to understand the meaning of what one is trying to convey. We can also say that hearing with attention is listening. When you listen to something from someone (especially as an order or request), you need not obey it. Unless and until your rationality approves it, or if it's legally mandatory for you to oblige. Most people often feel someone should genuinely listen to their thoughts, life experiences, and deep innermost feelings. They expect someone should truly understand them as a person. They also desire to get an emotional support from someone who is special. They are in search of a close friend with whom they can regularly converse and share moments of their lives. That's a human nature we all can't deny. Whenever a person approaches you and shares some aspect of his life with you then try genuinely to listen to him with great care. When you do so, it creates a good impression about you in his mind, and he feels warmly welcomed. You make him feel comfortable and significant about himself. Genuine listening is the highest form of a compliment you can pay to him. It also creates an impression of a good conversationalist. It helps him to open up and share more information about himself. While conversation is going on, don't break the talk in between else encourage him to talk more. When you sense, talk is coming to an end just raise a new question you feel he would love to answer. During conversing, if you find some good aspect or idea, then praise him sincerely but avoid flattery. If you encounter any mistake, just ignore it (Why? It is because we all make mistakes.) and keep focusing only on the right aspect of the talk. If you highlight any error to him even once, then he will suddenly stop opening up, and you'll surely miss a lot of useful information from him. 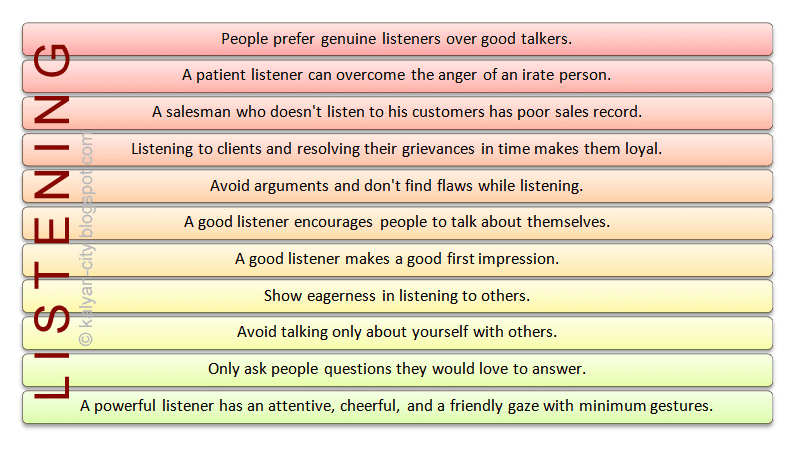 So it's best to avoid listening just to identify flaws, else focus on good things. A video by children giving tips on how to be a good listener. Video credits © Margaret Lim. Most people want good listeners because they expect someone should take a genuine interest to listen and understand them. Even important people do like to keep a company of a good listener over an excellent talker. A patient and sympathetic listener can overcome the anger of an irate person. A salesman who often doesn't listen to his customers breaks them while they are talking and contradicts them, irritates them enough to leave his stores. Listening to clients and resolving their complaints on time impresses them enough to remain loyal to the service provider. Neither get caught in an argument nor find flaws while listening. 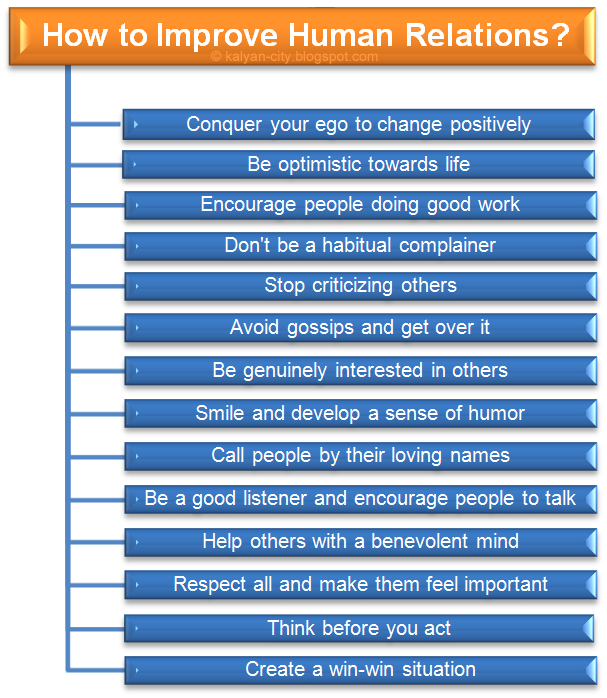 Be a good listener and encourage people to talk about themselves. Many people are unsuccessful in making a first good impression just because they don't listen. Show your eagerness in listening to others. Never talk just about yourself to others. Only ask those questions that people would love to answer. 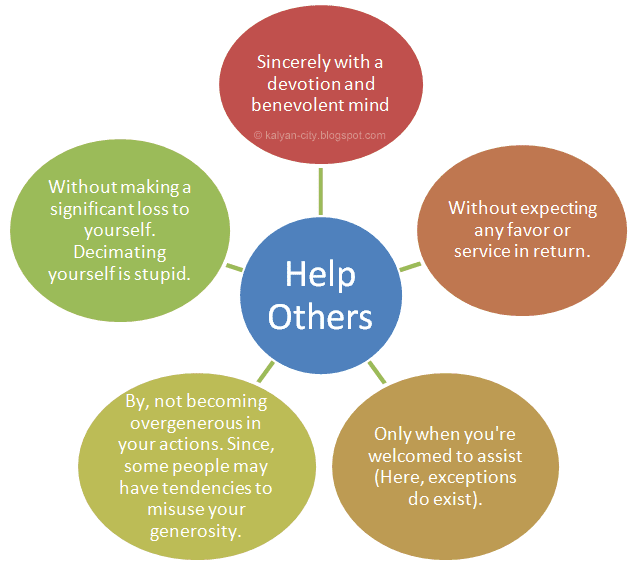 Helping mean to give assistance and make it possible for someone to do his work or activity with ease and comfort. It aids in reducing stress by minimizing one's workload and simplifying its complexity. People who assist each other sincerely without keeping any expectations in return are benign people. They quickly make good friends and maintain a friendly social environment around them. They are never ignored, get welcomed and are successful in keeping their relationships strong, trustworthy and open. It is better to maintain a company of such people to grow and prosper in our lives. Watch an inspiring video to realise the beauty of helping others. On the contrary, there also exist some cunning individuals who care only about their selfish aims. They believe in making use of people for their accomplishments or success. They just don't care enough about others' goodness and well-being. They are used to exploit the kindness and helpful attitude of a benign person. Sometimes they also indulge intrigues to misguide others by acting as a real helper. They are honey-tongued, lavish in flattery and manipulative in nature. It is advised to use one's common sense, intellect, human skills, psychology and life experiences; to avoid mingling with them. Sincerely with a devotion and benevolent mind. Without expecting any favor or service in return. Only when you're welcomed to assist (Here, exceptions do exist). By, not becoming overgenerous in your actions. Since, some people may have tendencies to misuse your generosity. Without making a significant loss to yourself. Decimating yourself is stupid. When you respect someone you actually sincerely admire an individual for what he or she is in life. You genuinely appreciate their qualities and achievements by simply ignoring petty limitations of them. You make them feel important and proud. Any person, whether a child, teenager, adult or senior citizen deserves an admiration, respect, and dignified life. We must all respect each other irrespective of our social status, income levels, living standards, types of work we do, religions beliefs, achievements, race, so on. Watch a video featuring tips on dignity and respect for improving relations. Video credits © Campaign Manager. As a result, on an individual basis, we must take good care to see that our beliefs, attitude, actions, and behaviors are neither demeaning nor hurtful to others' peace and tranquility. Acting without wise thinking is like riding a car without a trained driver. It's suicidal, isn't it? Before we act, we must be judicious about what will be the repercussions of our actions. Will it offend someone either directly or indirectly? Whether the outcome will be a good one or bad? If we are careful enough in our acts, we will lower any chances of us hurting ourselves and others. It is better if we think correct before we act right. A video explaining, human relations can improve by thinking before speaking. Video credits © West Hollywood Psychotherapy. 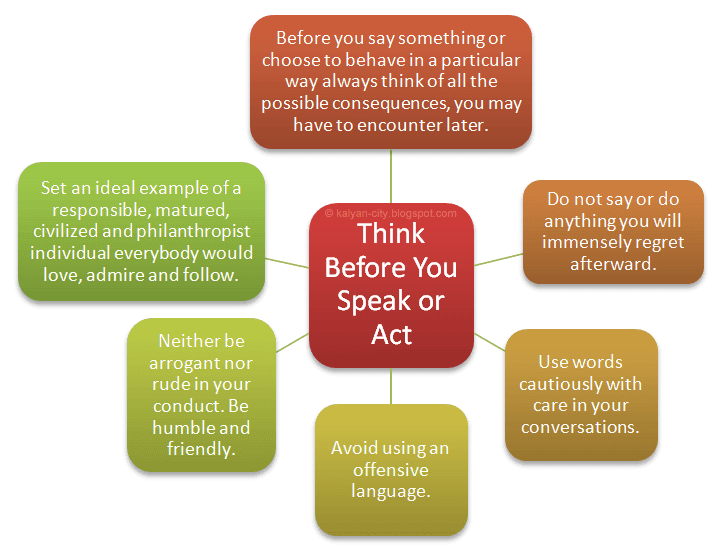 Before you say something or choose to behave in a particular way always think of all the possible consequences, you may have to encounter later. Do not say or do anything you will immensely regret afterward. Use words cautiously with care in your conversations. Avoid using an offensive language. Neither be arrogant nor rude in your conduct. Set an ideal example of a responsible, matured, civilized and philanthropist individual everybody would love, admire and follow. A win-win situation is a circumstance in which all concerned parties benefit, in one way or another, and nobody regrets losing anything. In simple words, everybody wins, and nobody loses. Here, all remains happy and content, and everybody gets a piece of the pie. Have you heard of Ichthyotherapy? If not, it is a natural beauty therapy in which a person undergoing treatment dips his body parts (legs or arms) in a water full of skin-eating fishes like Garra rufa. In this circumstance, fish benefits from eating away exposed dead skin as his food while the person's skin gets automatically exfoliated and adds to its esthetic value. Watch a streaming video of fish eating the skin. Video credits © Uncornered Market. It is the simplest example of a win-win situation in a general context. Can you imagine or recollect a similar instance in social or business context? We should create win-win situations in our daily lives to avoid conflicts. It will not only benefit us, but also care about all involved parties. Life is beautiful to live when we never stop showering our kindness on others with compassion, respect and care. The world is beautiful to admire when we treat others the same way we want them to treat us. You will see bliss in people around you when you will nurture their senses with your pristine love. You've the unimaginable power to lit a spark of happiness in everyone's life. So, the essentials of human relations can remarkably enhance our lives. How to Win Friends and Influence People; by Dale Carnegie. Human Relations; 4th Edition; by Dalton, Hoyle, and Watts. Human Relations in Organizations: Applications and Skill Building; 8th Edition; by Robert N. Lussier. President Roosevelt's undelivered address for Jefferson Day (Link).